Think fast — can you (and your team members) share the status of every lead you have ever received? Bonus round: Can you retrieve this information in fewer than 30 seconds? If your answer is “no” to either of these questions, then you probably need to investigate a new CRM (customer relationship manager — the way we keep up with our contacts) system. 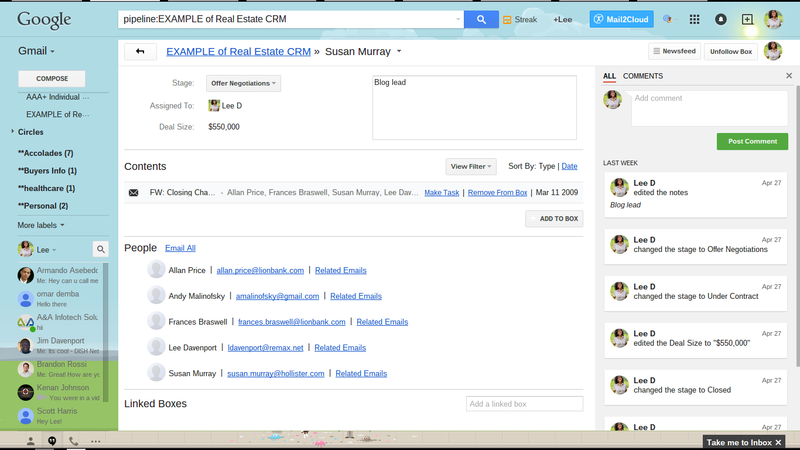 Much of what we do as real estate professionals requires email. We need to email documents to our clients, lenders, builders, home inspectors, attorneys and more. 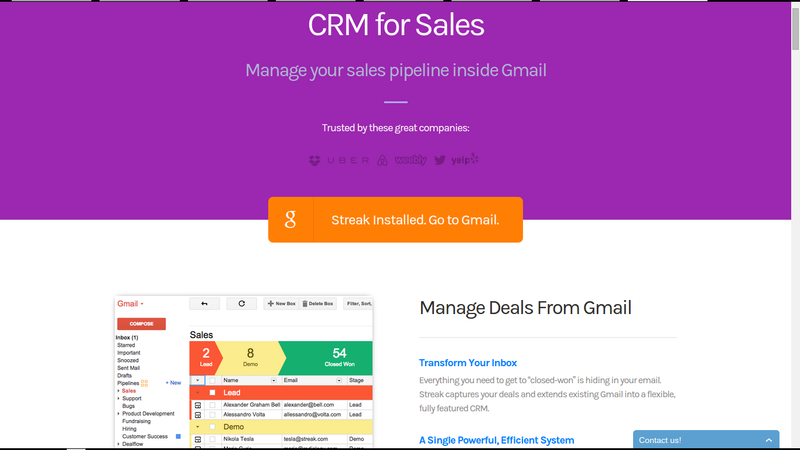 In the midst of such a maze and whirlwind of emails, you can imagine my elation when I stumbled across Streak, a CRM that works inside of my beloved Gmail. Streak is a game changer. This CRM has revolutionized my client connections, and it will probably do the same for you. I repeat: This is a game changer. If you are a real estate agent, have a team or manage a real estate office, no longer do you have to work between two, three or four systems to keep up with your contacts, documents by email, notifications, mass emails, meeting dates or graphical metrics to locate your business leads. Streak allows you to streamline your connections and contacts all inside of Gmail. If you are, unfortunately, caught in a matrix of various CRM systems, Streak can simply upload your non-Gmail contacts with a CSV (comma-separated value) file so you can get away from having contacts and database systems in multiple places. At first glance, Streak’s sales pipeline template has a few stages that we as Realtors might not use, or that we might want to relabel. Thankfully, Streak is easily customizable. Lead: Indicates when my team is notified of a prospective client. These can automatically distinguish your leads that come in from realtor.com, Zillow, your office website, etc., based on the settings you initially create; just do this once and Streak will work in the background for you automatically. Contacted: This stage shows who needs a call, email or text by someone on my team. First appointment: This stage means that the lead responded to our outreach, and we have an appointment set with him or her. Follow-up: This is our opportunity to follow up with the lead after the appointment. Signed exclusive brokerage: We move contacts to this stage once they are on board to work with us in finding or selling a home. Search: Contacts go to this stage once we are working with them to locate or sell a property. Offer Negotiations: This stage allows us to keep track of those who have outstanding offers yet to be accepted. Under Contract: This represents our contacts who have a binding agreement to purchase or sell real estate (woo hoo!). Clear-to-Close: Contacts go to this stage once underwriting and title work is complete, and we have the “green light” to set a closing date. Closed: This stage represents clients who need to be sent closing instructions, reminders and links to complete an online review. 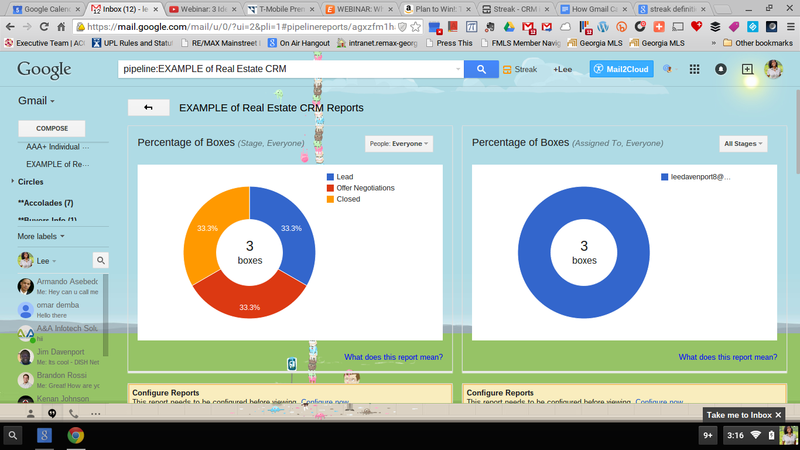 This was just an example of how Streak’s pipeline can be built out for real estate so that leads stop falling “between the cracks” of a faulty or incohesive mixed bag of CRM tools. You can add, subtract or modify stages based on the relevance of your business. For example, in reality our team would add several stages after “closed” to be sure that we are staying in contact after closing, including home anniversaries and the like. Furthermore, you can create additional pipelines. Perhaps you want to track different pipelines for lead conversion, under contract and follow-up after closing, which you can with Streak. 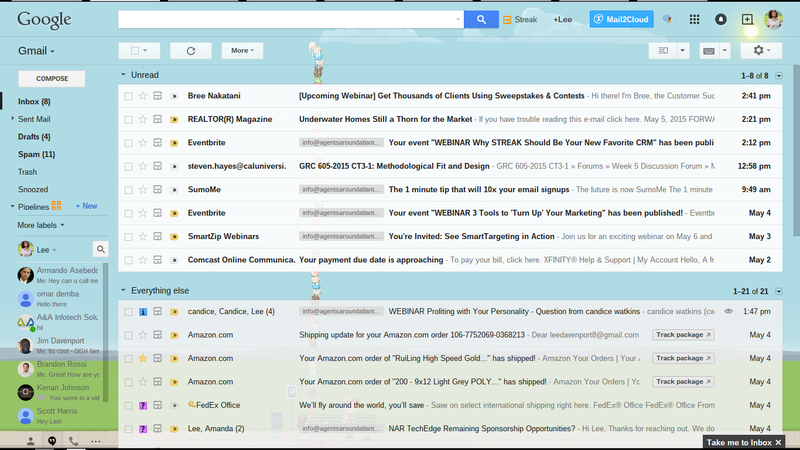 The beauty of this is that you can access all of these pipelines and their corresponding stages within Gmail. This has been a massive time-saver and has led to us being more effective and efficient in keeping up with contacts. Another feature of Streak is that when you click on a contact, you can see all of the relevant notes from everyone on your team, all of the tagged emails and all parties that have been included on emails (which is great when you have forgotten who the co-op agent, spouse or lender is); you can create reminders and alerts; and, you can change the stage that the contact is in. This is particularly helpful when you are part of a team or firm and you do not want to have to spend precious time chasing down someone to get the latest status update — you can see it all in Gmail. With Streak, you can set reminders that will archive the email and pop-up in your Gmail inbox at a later date. This feature is very similar to Gmail’s new Inbox app, but Streak goes a step further by allowing you to note why you need a reminder (for example, “Follow up with Mary on 7/18 to see if she received her bonus and can make a larger down payment”). These handy features in Streak help to truly make “senior moments” a thing of the past. As a bonus, you can share certain contact details with a specific party of the transaction or an entire pipeline with relevant members on your team — you choose. For instance, say that you forgot to copy the co-op agent or your broker on a particular correspondence. No need to forward email after email. Now you can give someone access to view a particular client and all of the relevant emails by clicking the “share” button or adding them to the “follow” options. Boom! These are some of my favorite features of Streak, but this is not an exhaustive list because I do not want to spoil the fun and ruin your discovery process. As you may have guessed, I like keeping up with the latest tools to help your business grow; I’m hosting a no-fee webinar on June 2, where I’ll share 3 Ideas to “Turn Up” Your Summer Marketing.